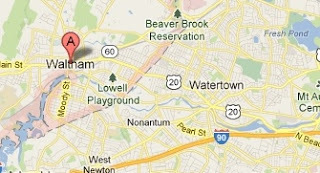 Benjamin Blanchard was the son of Jonathan and Anne Lovejoy Blanchard of Andover, MA. He was born on 14 Feb. 1692/3. I doubt the Puritans would have been celebrating St. Valentine's Day, so this would have been a day like any other. 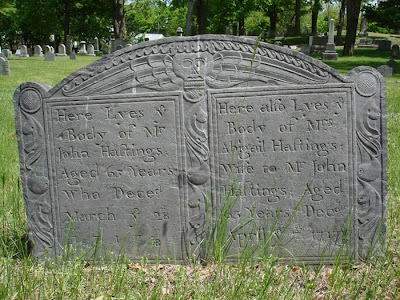 On Dec 29, 1718 he married Mary Abbott, daughter of Nathaniel and Dorcas Hibbert Abbott, also from Andover. 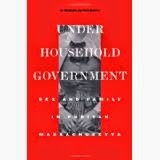 After their marriage the family steadily grew as did most good puritan families, adding a child every two years or so. Altogether they would have 12 children, all born in Andover. Their 10th child, Abiel, was born in September 1737. On October 13, 1739 Benjamin and Mary's nine year old daughter Dorcas died, Abiel died two days later on the 15th. The next day eleven year old Jonathan died and finally on the 19th, seven year old David passed away. Four children dead in six days. The children all died of Scarlatina, a form of Scarlet Fever, which they called a "throat distemper". The disease began ravaging New England families in 1735. It was not uncommon for families to be decimated by the disease. In Andover four families lost a combined 14 children in 72 hours. In an age without antibiotics there was nothing the family could do other than try to comfort the sick children. Mary was pregnant at the time of the epidemic and gave birth to a son, who they called David, in February of the next year. David died two months later. It was very common for parents at that time to "recycle" a name, Benjamin and Mary did this twice. They would have one last child, called Abiel, born in 1741, tragically he would die before his second birthday. The move was a new beginning for his children as well as Benjamin, each married and began their families in Hollis. Benjamin Jr. eventually left Hollis and moved north to Canterbury, NH. Benjamin Sr. is said to have gone with him and died there around 1770, but there does not seem to be any evidence of this. There is no record for his wife Mary after the birth of her last child. 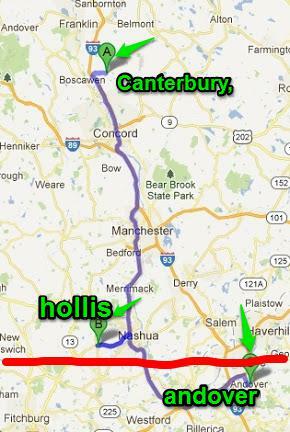 The first town meeting of Hollis was called in 1746, Benjamin was elected fence viewer. He or his son Benjamin Jr. held various post until they left Hollis for Canterbury. their children lived in Hollis. Jonathan was one of the first to recieve land in Hollis before 1741. He was a surveyor and laid out town boundaries for the new town. Chasing Samuel Thornton My Elusive Ancestor, Or Is He? First off I have to admit I have come no closer to finding my elusive ancestor, Samuel Thornton. That said, I am rapidly coming to the conclusion that he is NOT my ancestor. I am sure you are shaking you head saying that I am wrong, because our ancestry is all documented in that great book by Charles Thornton Adams. So let me start with the book. 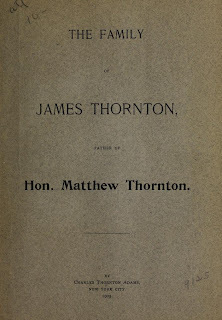 Printed in New York in 1905, the book is entitled "The Family of James Thornton, Father of Hon. Matthew Thornton". 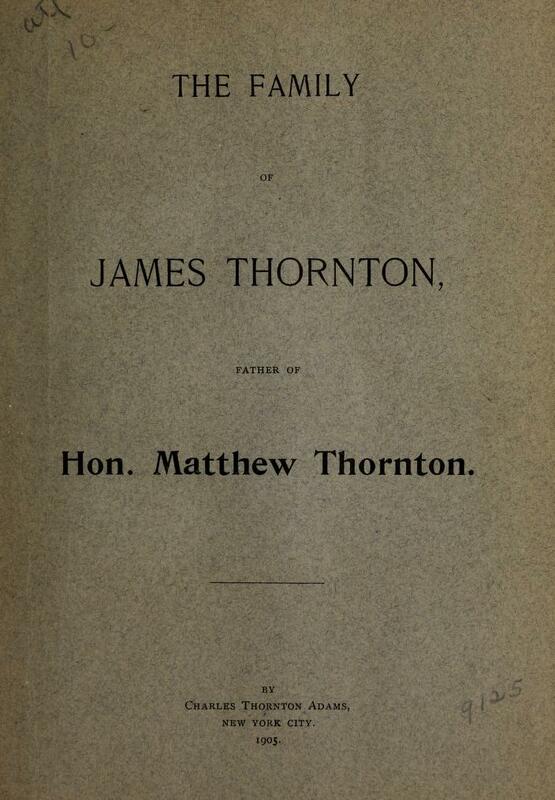 The author attempts to trace all the descendants of James Thornton, who with his family immigrated to the Massachusetts Bay Colony in 1720 from Londonderry, Ireland. Charles Adams seems to have done a great job of rooting out the families of James' children, each having a fairly comprehensive bio of their life and their descendants down to those living in the year the book was published. 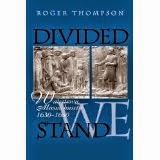 This included my great grandfather John Clark Thornton. John it is said is a descendant of Samuel Thornton, brother of Hon. Matthew Thornton, signer of the Declaration of Independence for the state of New Hampshire. For the history lovers in my family, myself included, this connection to a historical figure is not only fascinating but a point of pride. Samuel Thornton, brother of Hon. Matthew Thornton, lived at Campton, N. H. and later at Hatley and Stanstead, Quebec, Canada. He is said to have married twice and had 22 children, eleven by each wife. By the second wife he had the following children: 1. Samuel b. 1775 2. Reuben 3. Sarah 4. Abram 5. Catherine 6. Dorcas b. 1779 7. Eleanor 8. William 9. Sumner 10. Hannah 11. ? I put the words "he is said" in bold to emphasize how little of this bio is based on documented facts. In truth the only facts in that paragraph are that his son Samuel was born in 1775 and daughter Dorcas was born in 1779. There is nothing to prove or disprove for that matter that Samuel lived either in Campton or Hatley. There is absolutely no records that I can find that give any hint of who he was or where he lived. And, how does a man have 22 children and yet only two of them are even remotely traceable? Even with a high infant and child mortality rate you would think that at least a third of them would have survived. Samuel 2, when 17 years of age, went to London, England. He adopted a system of coking which gave him great success among the iron masters near London. 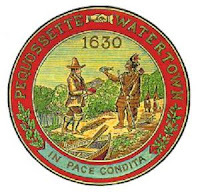 He returned to America and settled in Wheelock, Vt.
Let me start by saying that if Catherine Baker was related to Lord Chatham, AKA William Pitt the Prime Minister of England, I cannot find the connection. Her ancestors were almost all in the colonies by the mid 1600's, so I am pretty sure that tidbit is fiction. I also have a problem with the part about Samuel going to London at age 17, and wooing the Iron Masters of London with his mastery of a coking system. Why would a farm boy of 17 go to London in 1792, where I'm sure Americans were not too popular. He then amazes the Iron makers in London and by age 23 returns to New Hampshire and once again becomes a farmer. Nothing in that makes any sense to me. In 1797 Samuel's name appeared on a tax list for Campton, NH. He was not a resident of the town but he did own some land there. In 1799 and 1800 his name was listed as a tax payer in Thornton and a land owner in Campton. In 1801 he was listed as a land owner and resident of Campton. In 1802 he married Catherine Baker of Campton. The records for the Thornton tax list jump from 1800 to 1816 so I don't know if he still owned land there. Also on the tax list for Campton in 1800 was John Durgin who would marry Samuel's sister Dorcas in 1802. Samuel remained on the Campton tax list until 1806 when his name was gone. 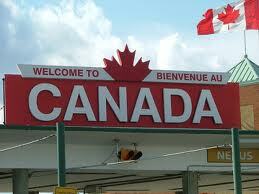 In 1808 his second child, a son named David, was born in Hatley, Quebec, where the family remained for many years. So who does this sound like: lived at Campton and later Hatley,Quebec? It sounds like the bio for Samuel 1. Samuel 2 was in the 1825 census for Hatley, after that he is next found in the 1840 census for Wheelock, Vermont. He was then 65 years old. This can hardly be described as "he returned from London and settled in Wheelock". I think that Adams took the info he had on Samuel 2 and mistakenly applied it to Samuel 1. So who do I think was the father of Samuel 2. I think it was William Thornton, also a brother of the Hon. Matthew. William married Dorcas Little by 1744, together they had six children that lived to adulthood. 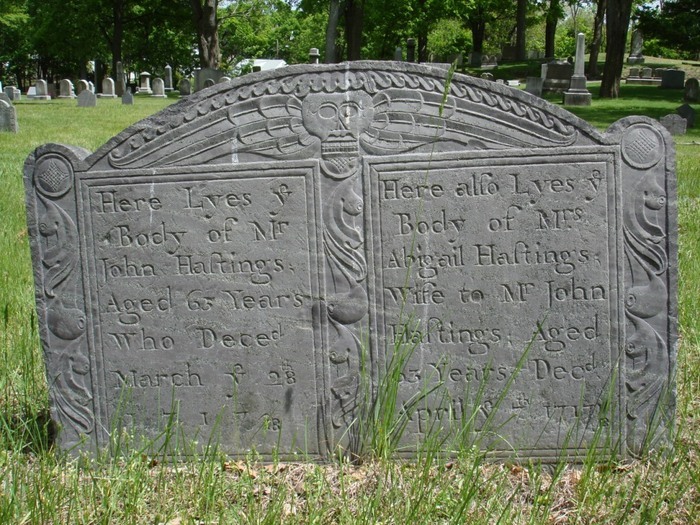 Dorcas died in 1763 when the family lived in New York. 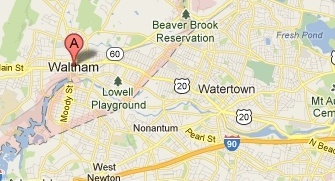 William left NY and returned to New Hampshire in 1774. He was in Thornton, NH by 1775. He married for a second time, either in NY or NH to a woman named Elinor. William died in 1790. At the time of his death he left three children under the age of 7: Abram, Sarah and Catherine. His will was finally probated in 1798 and Elinor, who had already remarried, received her dower land. This second wife and second set of children are completely left out of the Adams manuscript. Could William be the man with two wives and 22 children? 1. Samuel 2. Dorcas 3. Abram 4. Catherine 5. Sarah. Throw in a wife named Elinor and it starts to look a lot like the names of the children of Samuel 1. If William was not the father of Samuel and Dorcas, how did they get to Thornton, where did they live, who did they live with? Their sister Catherine Thornton, who never married, also lived in Thornton. She is in the 1830 census and later lives with Dorcas' family. To my mind, given the total lack of info on Samuel speaks more to the possibility that he died young without children than the idea that he ran off to Quebec during the American Revolution. UPDATE: I HAVE FOUND PROOF THAT SAMUEL WAS THE SON OF WILLIAM please see this link for the story.